The 64" Evolution E2 Wide-Format Cutter Bar from KeenCut has a 74" silver anodized aluminum baseboard with a replaceable nylon track, with an adjustable bearing and slide system. On the baseboard, a cut groove runs the length of the track and accommodates certain blades that won't cut into the baseboard. The ergonomically designed head comes supplied with three different vertical cutting blade holders that can cut a variety of materials. The Graphik Blade Holder accepts blades that are designed to cut tougher materials, such as acrylic, corrugated cardboard, matboard, and material up to 0.5" thick. The Medium-Duty Blade Holder accepts standard utility blades for general-purpose cutting, while the Textile Blade Holder comes enclosed with the circular blade, to cut and trim more delicate materials like paper and fabrics. KeenCut recommends using a cutting board under your material when using the Textile Blade Holder. The depth of the Graphik and utility blades can be adjusted, and the spring-loaded cutting head retracts back when not in use. 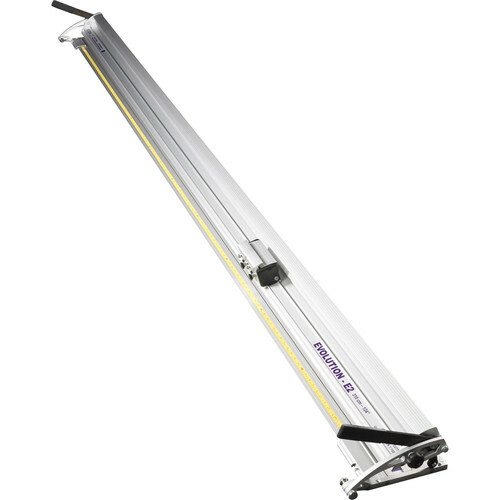 The integrated lift-and-hold system allows you to load material easily into the cutter, and the track clamps down and holds the material firmly in place because of the silicone rubber grips that follow the length under the track.